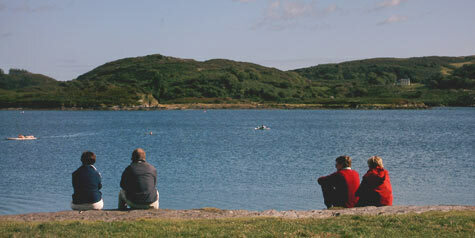 Allround English Courses are a unique combination of total immersion English training and an unforgettable English Language Holiday in Ireland. You can stay with your teacher Jane O’Brien and your host Susan O’Brien at her house, Big Moon Cottage, a beautifully restored cottage only 20 minutes walk from the breathtaking Atlantic coast of West Cork or at a nearby guesthouse. We will speak English from morning to evening through lessons, meals and outings. You will have English lessons in the mornings, in a small group of 3 — 6 people. All courses are specially tailor-made for the level and professional or personal requirements of the group. Your trainer Jane O’Brien has over 20 years experience teaching English to people of all levels and professions. In the afternoons we can explore this stunning corner of Ireland, with it’s mystical lakes, lush green hills, rocky bays, sparkling beaches and colourful and lively towns and villages while continuing to practice English. In the evenings we will all sit together over a delicious dinner or a drink in the pub and talk and talk.